Effects of Injection Parameters on Combustion Characteristics of Biogas-Diesel Dual Fuel Engine with High EGR Rate Li Zhenhua;Tao Wencao;Zhu Lifeng;Shanghai Diesel Engine Co.
Research on Application Matching and Performance of Diesel Oxidation Catalyst for Heavy-duty Diesel Engine Zhuang Jian;Li Mengli;Shanghai Diesel Engine Co.
Design of Lean Engine Manufacturing System Zheng Youcun;Shanghai HINO Engine Co. Structural Strength of Fuel Nozzle Lip Seal Ring Zhang Zhiyong;Wang Kui;Zou Sai;Dong Jingjin;China Shipbuilding Power Engineering Institute Co. 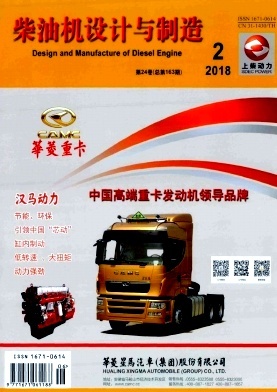 Analysis of and Solution to Crankshaft Wear of an Engine for Sand Sucking Vessel Wei Lai;Shanghai Diesel Engine Co.
Development of a High-performance and Light-duty China-V Diesel Engine Yan Yonghua;Deng Mei;Shanghai Diesel Engine Co.
Research on Hydraulic Retarder Matching for Heavy Trucks Peng Debiao;Shanghai Diesel Engine Co. Experimental Study on Controlling Milled Surface Quality for Adhesive-sealing Performance Wang Lixin;Hu Bin;Pan Asia Technical Automotive Center Co.